Islanders love football. With Saturday and Sunday Isle of Wight Football Leagues to follow, make sure you head back to our Sports section to see regular updates during the football season. If your football club is not featured, get in touch and see what we can do. 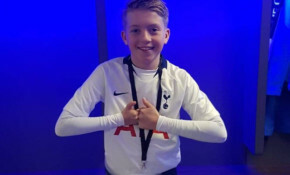 Watch the moment 11-year-old Nicholas Gregory from the Isle of Wight walks out on the pitch at Wembley Stadium as mascot for Tottenham Hotspur. The assistant manager of Newport Under 16s expresses his shock at what happened during Sunday's match, explaining that the away team parents started throwing punches in the stands, whilst frightened young children watched on in tears. Well done to all involved with Newport Under 15's Football Club who celebrated their eight trophies in an end of the season awards ceremony. The team will be taking part in the the SCI tournament held at Seaclose over the May bank holiday weekend and a Sports tours Tournament at Camber Sands, later in the month. The club say they had many applications which were of an extremely high calibre, but have made their choice for the new season. The former player, Derek Ohren, returns to Newport FC following the resignation this week of Michael Kelly. Well done to all the team players for their recent successes. You can watch them play on the Isle of Wight on Thursday 22nd March at Westwood Park Cowes in the final of the Island under 16s League Cup. Whilst Rew Valley youth girls' team is flourishing, players are still needed for the Under 12s and Under 15s mixed teams. Unless extra players are found, the two teams may have to fold. Ryde Rotary have been helped with training travel costs for Ryde resident, Charlotte Laidler, who's been selected to join the GB team and compete in the European finals of Flag Football. Congratulations to Newport Under 14s who were crowned champions of the national tournament at the Grand Finale Champion of Champions event held at The National Football Centre in Burton. It's been a busy time for the players of Newport 14s football team. The club have been invited to collect the award as part of the Hampshire FA Grassroots Football Awards on Saturday 3rd June at St Mary's Stadium in Southampton.